Bath time is lots of fun!!! Baby William is now a little over two months old and weighs a whopping 12 pounds! He is obviously a good eater! Every evening around 7:30 he gets all worked up and the way I soothe him is by putting him in a warm, bubbly bath. It's as if he changes his entire personality the minute his bottom hits the water. He is always sticking his tongue out except of course when I am trying to clean it! Last night he slept a whopping 7 hours straight. He's such a good baby! Yes, bath time is so much fun, for them that is, LOL! awwwww!!! the sight of a very loved baby! 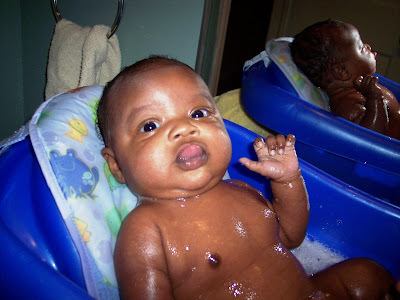 Jayden doesn't quite like bath time, lol! We gotta work on it! Look at that face! He is adorable! Aww. You always have such wonderful photos of all of the kids to share with us!